Contained is an overview on generating reports within the system. Reporting is broken into three categories that represent each of the three major activities within the program, E-Learning, Communications, and Events. Click on each of the categories to report on that particular item. You may chose any or all of the available filter parameters before clicking Search to generate your results. Having generated your results, you will be presented with a handful of options found towards the top right of the report. and run this saved report over and over and get the results in real time. Subscribe: You may elect to have this report emailed to you on an interval of your choosing. You may also copy and subscribe others to this same report so that they may also get a copy of this information. Export: The output of this report can be exported and saved into a Comma-Seperated-Value (CSV) format that is easily opened within Excel. 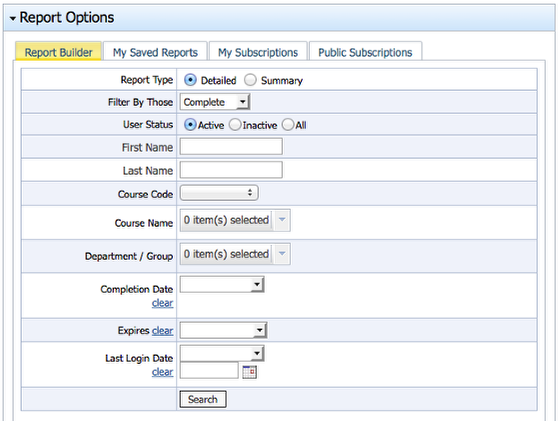 Clear: The report options selected will be reset giving you a clean slate to generate a new report of your choosing. You may elect to have this report emailed to you on an interval of your choosing. You may also copy and subscribe others to this same report so that they may also get a copy of this information. to you if there are no results in the report. Copie(s) To: This is the equivalent of a Carbon Copy (CC) within an email. The individuals you copy to will get the exact same report as you would receive to your Inbox. will only see on the report all those users underneath that department. 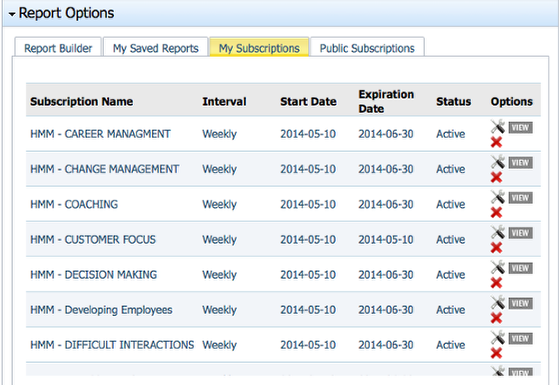 When subscribing or saving a report, these reports will be stored within their applicable category/tab as depicted above. My Saved Reports: Will contain all those reports saved. My Subscriptions: Will contain all those subscriptions active or inactive ever created. My Public Subscriptions: Will contain a list of those reports that someone else has subscribed you to.